NATIONAL TRAILS DAY & Poker Hike! 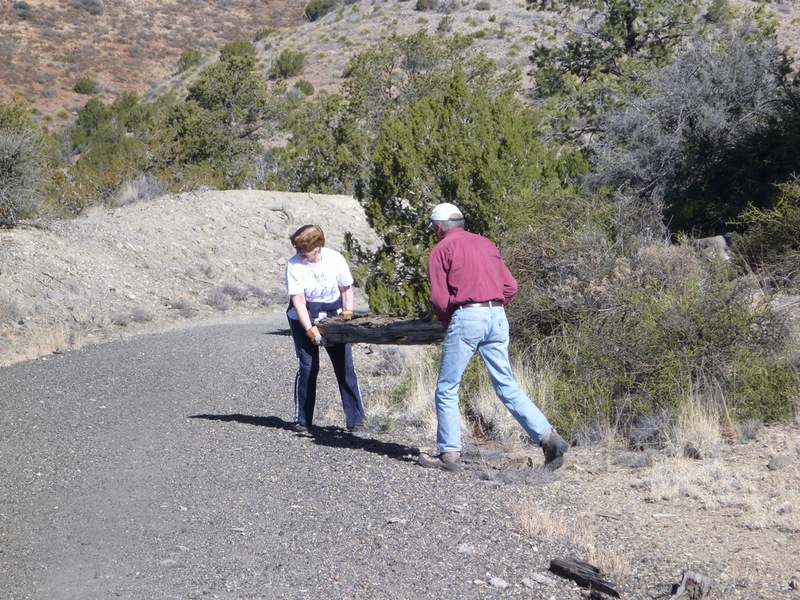 On National Trails Day, Saturday, June 3, the New Mexico Rails-to-Trails Association will open the Bonnie Brooks property for viewing the area’s newest historical site, BONNIE’S TRESTLE, currently undergoing restoration. 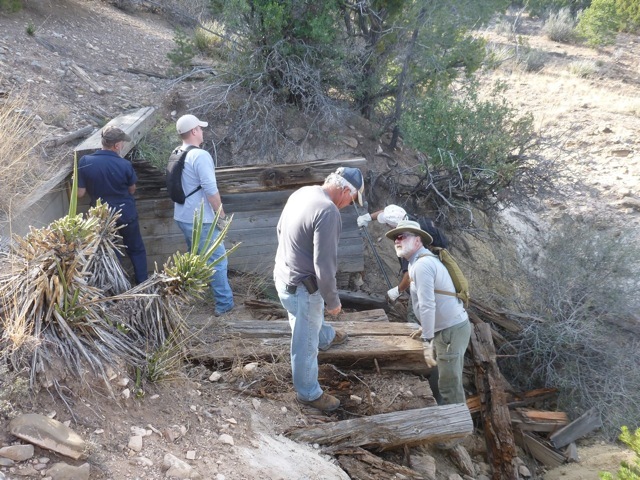 Besides a close-up view of the trestle work, the property also offers a walk to the Mexican Canyon Trestle over a near-pristine section of original railbed not often available to the public. Gates are open from 9:00 am to 4:00 pm, with refreshments and displays available at Bonnie’s cabin, near the trestle. To access the venue, start from the Depot at the Trestle Recreation Area in Cloudcroft, and follow the signs to Bonnie’s Trestle. The area will also be open on Sunday the 4th, and three weekends during the summer season, July 8 & 9, August 5 & 6, and September 9 & 10. And, if you want to add some adventure to your Saturday, join the free Poker Hike that Rails-to-Trails is also sponsoring in conjunction with the Brooks property opening. The hike is only 1.3 miles long – perfect for a family. Start any time between 9 am and 11 am at the Trestle Recreation Area, and turn your poker hand in at the 5th and last stop – Bonnie’s cabin – any time before 12:30 pm. Winners will be announced at 12:45 pm, with prizes for the three best 5-card poker hands. Winners need NOT be present! This is not a race – winning is strictly by chance. Take your time and enjoy the hike. NMRTA Annual Meeting – Friday, May 8th! It’s that time again! 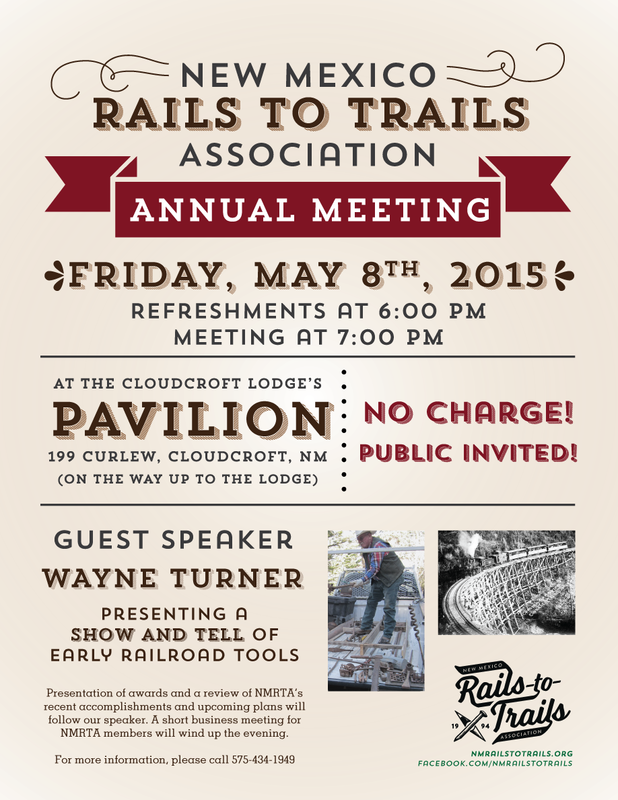 Please join us on May 8 (that’s a Friday) at 6:00 at the Lodge’s Pavilion in Cloudcroft for our ANNUAL MEETING. If you haven’t been to one of our annual meetings in the past, it’s nice for you to know that this is not so much a MEETING but more of a casual, social gathering where we’ll feed you some free hors d’oeuvres, talk about what all the local Rails-to-Trails has done this last year and what we plan to do in the future, AND we always have a guest speaker. This year, we have Mr. Wayne Turner, who worked for the Santa Fe Railroad for 35 years — most of those years as a structures foreman building bridges. Mr. Turner will be presenting a “show & tell” of many unique tools used by the worker as they traveled with the railroad in those earlier years. We can also expect short presentations from the Forest Service as well as several local area hiking groups. We expect it to last until around 9pm but it’s a totally open meet so you are free to come and stay as short or long as you like! We certainly hope to see you up at the Pavilion at 6:00pm, Friday, May 8th! There’s no admission charge and should be a really great time! We had a PHENOMENAL work day last Saturday! 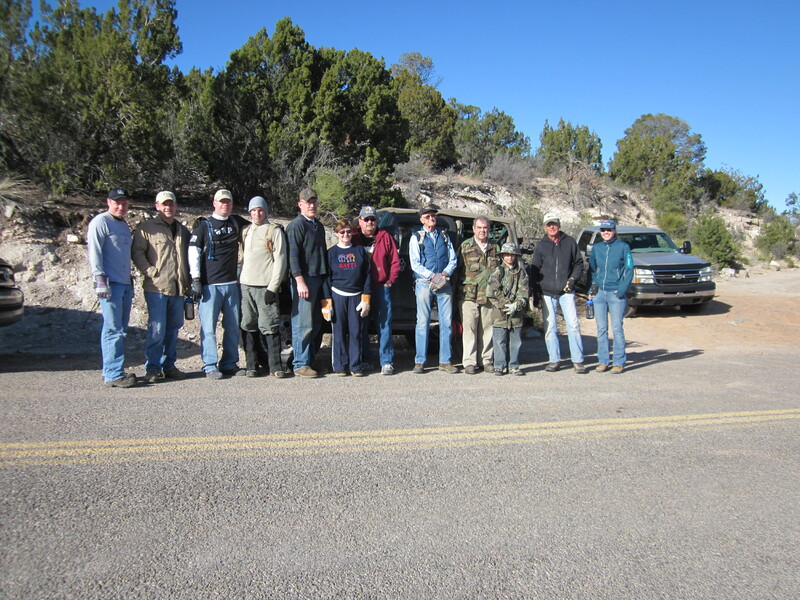 We ended up with 24 volunteers (including two Forest Service representatives) so we got a lot accomplished! 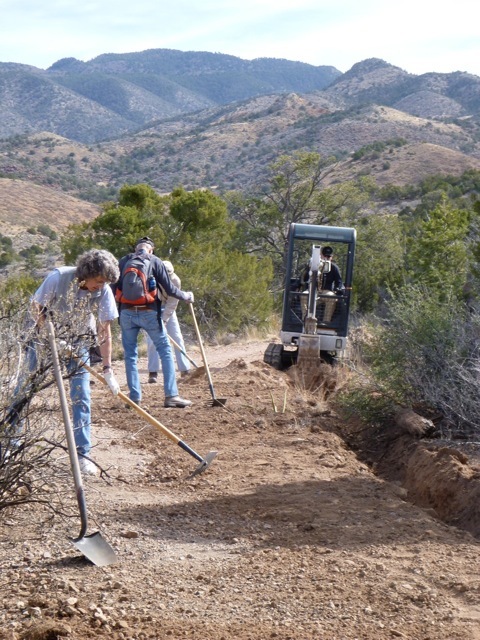 We worked on the Clarke private property (through which we have a legal easement in place for public access) down at the mouth of Laborcita Canyon outside La Luz. We filled most (not all) of the holes caused by the old water line failures. Cleaned rocks and weeds from most of the rail bed (though there’s more to do). We worked on most of the old wood culverts — cleaning out the input sides — we have more to do with those. 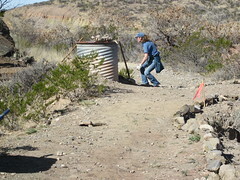 MAJOR IMPROVEMENT: We routed the rail bed around one of the more dangerous spots near the end of the property. Cleaning up the rail bed! As always, we’ve got many more photos! Check them out on our official Flickr page! 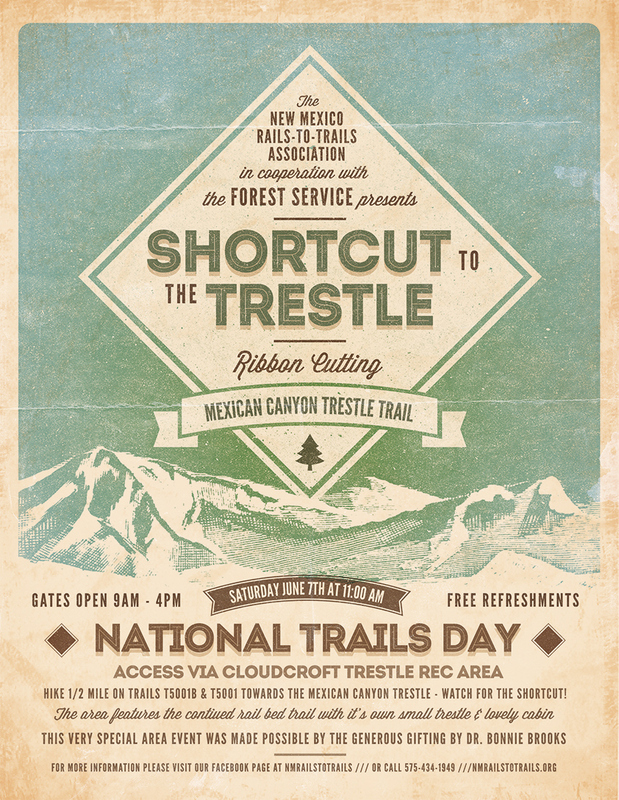 National Trails Day – New Trail segment ribbon cutting! Inaugural Opening…Shortcut to the Mexican Canyon Trestle. 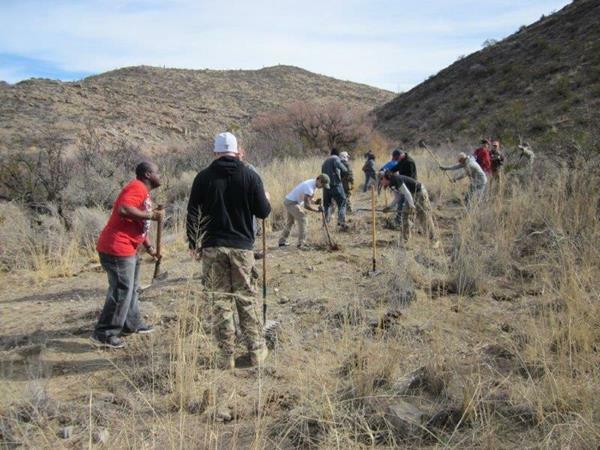 On Saturday, June 7, National Trails Day, our New Mexico Rails to Trails Association will host the inaugural opening and ribbon cutting of a section of the original rail road bed previously unavailable to the public. 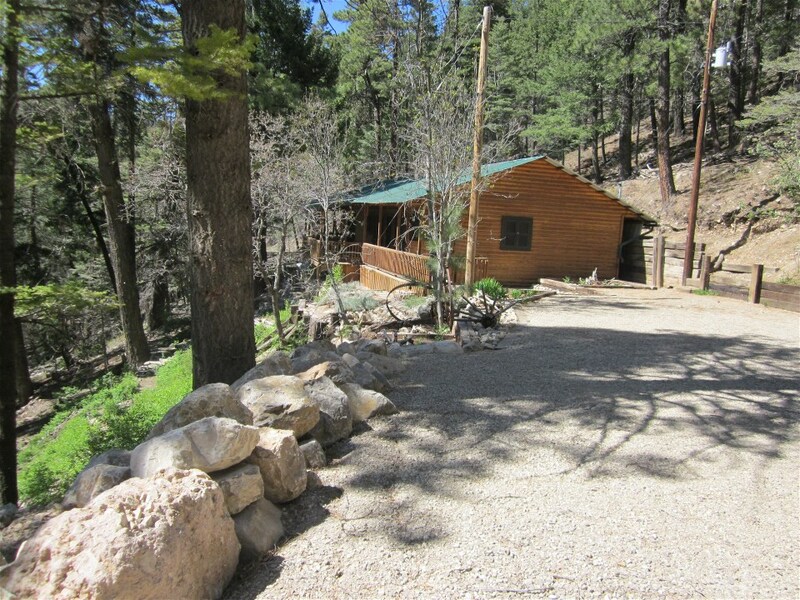 This pristine 800 foot stretch of rail-trail is located just up-trail from the Mexican Canyon Trestle, and contains is own trestle and a beautiful, quaint cabin. Gates will open at 9 am, with a short ribbon-cutting ceremony at 11 am, and close at 4 pm. Displays and refreshments will be available. This shortcut will only be open to the public on select days during the summer/fall season. Access to the new section is about 1/2 miles down-trail from the Trestle Recreation area using Forest Service Trails 5001B/5001. The Rec Area is immediately west of Cloudcroft. Signs will be posted. An alternate access is also available via Little Mexican Canyon Road located at the Highway 82 entrance to the Rec Area. This access is also walk in only-no vehicles allowed, and the road is very steep (even steeper on the way back!). And there is no public parking in the immediate area. 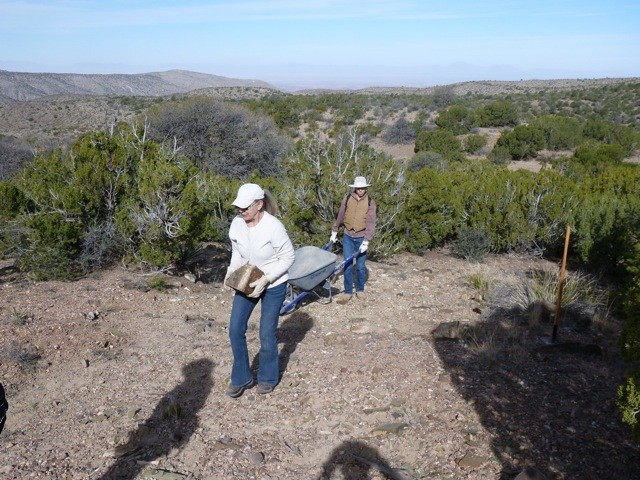 Dr. Bonnie Brooks, who has a tremendous affection for the area, recently granted property to the New Mexico Rails-to-Trails Association as part of a life estate deed. The new shortcut is on this generously donated land. Dr. Brooks will be at the ribbon-cutting. NMRTA is preparing the area for visitors to enjoy on June 7th, and is particularly working hard to complete construction of “Bonnie’s Bridge”, a small bypass footbridge that will allow visitors to view the features of the railroad trestle that is no longer safe for public use. NMRTA Annual Meeting – Friday, May 2nd! It’s that time again! Please join us on May 2 (that’s a Friday) at 6:00 at the Lodge’s Pavilion in Cloudcroft for our ANNUAL MEETING. If you haven’t been to one of our annual meetings in the past, it’s notsomuch a MEETING but more of a casual, social gathering where we’ll feed you some free hors d’oeuvres, talk about what all the local Rails-to-Trails has done this last year and what we plan to do in the future, AND we always have a guest speaker. This year, we have the wonderful Dr. Bill Boverie providing us with a very, very interesting local history! Dr. Boverie will speak to us through the words and character of William Ashton Hawkins, the attorney for the Eddy brothers and was instrumental in the foundation of Alamogordo and establishing the local railroads. This is a unique experience to hear and see Dr. Boverie as Mr. W.A. Hawkins himself (complete with top hat and tails)! We certainly hope to see you up at the Pavilion at 6:00pm, Friday, May 2nd! There’s no admission charge and should be a really great time! Even though we had to reschedule this month’s workday at the least minute, we had another great turnout! 18 willing and able bodies showed up and met again at the top of the Bridal Veil Falls trail. We ended up splitting into three groups and spread out a bit on the trail — one group began working on the erosion control culvert area; another headed down the trail and worked on some erosion control (lots of rock-moving) and yet another group followed a forest service worker driving a small excavator, helping spread out the dirt and rocks dug out from the edge of the trail. The ultimate goal was to help give any future water a better place to go rather than wash away the existing trail! The pace was a little slow and some heavy rocks were hauled off the trail, but all in all it was a great success! 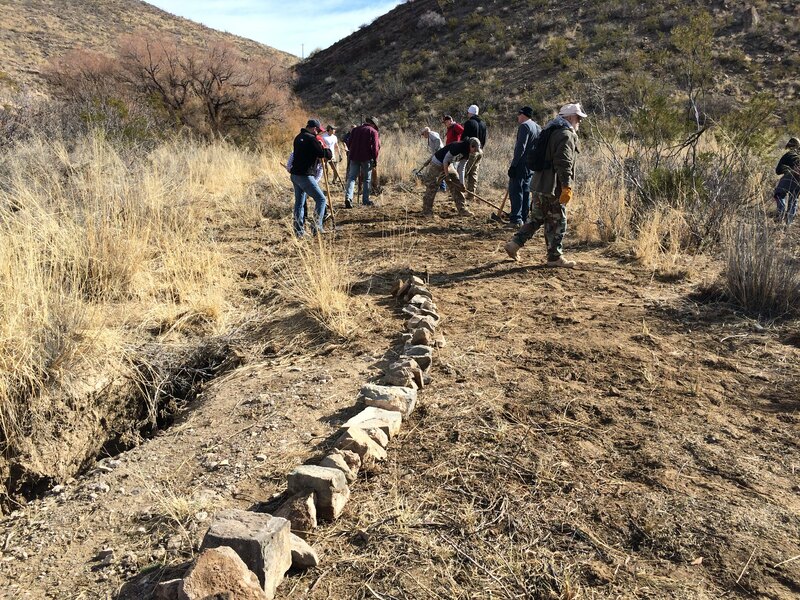 Next month, we will continue restoring the 100+ year old erosion control structure and continue trail repair, all in this same area. Relocating rocks big and small! 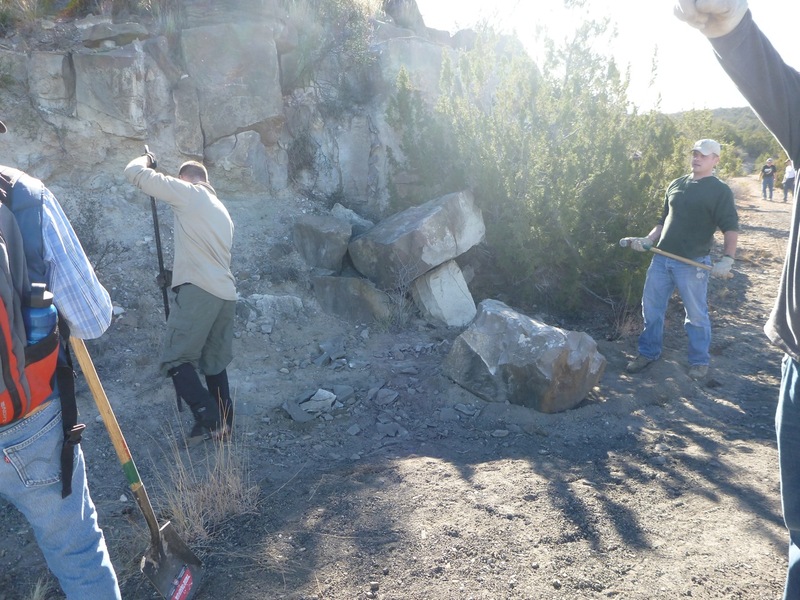 We had yet another very successful workday this month! We had a great turnout with 21 volunteers to include two out of state visitors — Roger and Holly Rosin — from Minnesota. 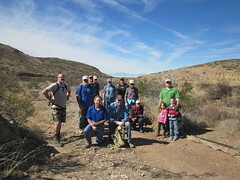 They were corralled in to our workday by Rails-to-Trails member John Reimer. 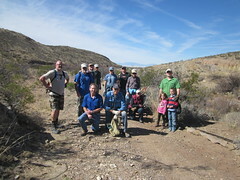 Thirteen volunteers gathered at the parking area at the top of the Bridal Veil Falls trail and walked the 1/2 mile down-trail to the worksite where 2 Forest Service representatives, Dario Samora and Heather Burman (along with other volunteer trail workers) met everyone after using a private back road to deliver an excavator and hand tools needed for the job. Dario, under the guidance of Heather, dug almost 450 feet of drainage ditch with the excavator. 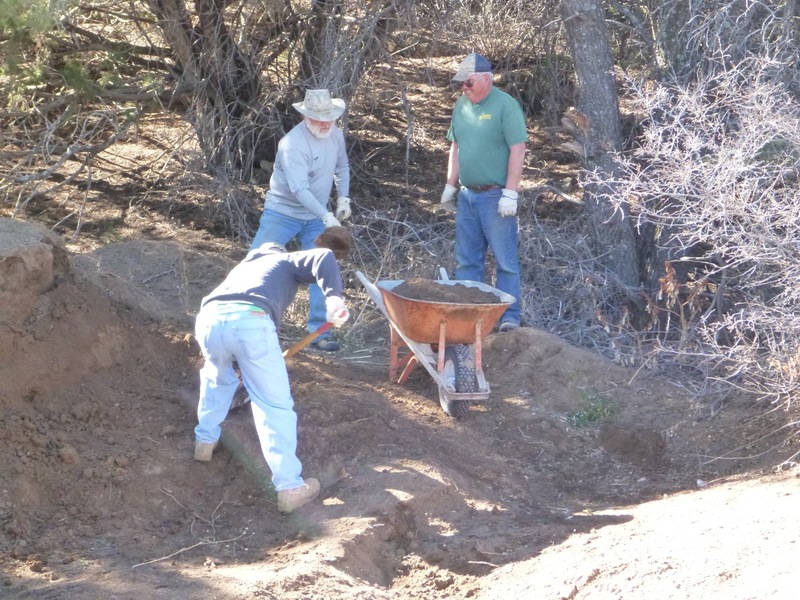 The huge amount of resulting dirt and rocks had to be moved and relocated by hand and wheelbarrow to fill in eroding sections of the trail and to smooth the trail tread. 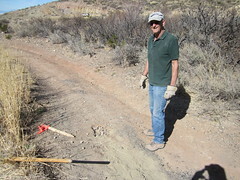 The new ditch, and another 600 feet or so of existing ditch, had to be cleared of debris, rocks, shrubs, and some of the original rail road ties. Of course, all the railroad memorabilia was carefully repositioned along the trail out of the path of potential water damage. One particularly large rock in the path of the excavator had to be broken with chisel and sledge into several manageable pieces for moving — it was a really back-breaking and bone jarring ordeal! 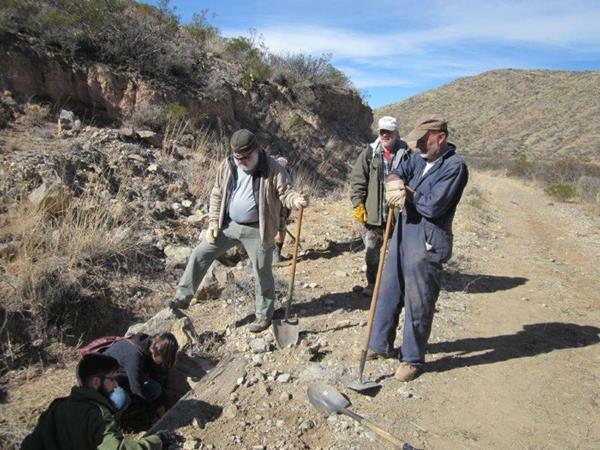 All this “chain-gang” type rock and dirt work, and a warm day, proved to be very exhausting, even to the five Holloman volunteers whom we relied on for their strong backs while those who were a little older and smart enough not to get caught up in the heavy rock stuff and pushing wheelbarrows, cleared culverts in the area and “beautified” the trail by smoothing the dirt and lining the trail with rocks. Next month, we plan to begin restoring a 100+ year old erosion control structure and continue trail repair, all in this same area. 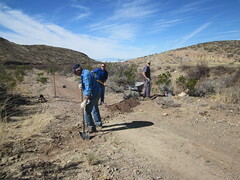 Regulars Glen Fess and Doug Holcolmb along with another dedicated volunteer hauling more dirt! Making big rocks into small rocks!